Blackbird's exploration of out-of-copyright work begins with this essay by Walter Hart Blumenthal, which appeared in The Bookman, March 1921. 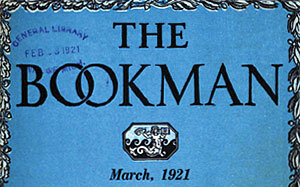 Blumenthal provides a brief and eclectic survey of unusual books and binding, including a discussion of the “bottle-book” in the year after the United States enacted prohibition. Read the essay with an awareness of its place on the timeline. (For fans of Masterpiece Theatre , this is soon after the events of the second season of Downton Abbey.) 1921 was also the year the BBC was founded; Anatole France received the Nobel Prize for Literature; Edith Wharton received the Pulitzer Prize in fiction for The Age of Innocence. For fans of Harry Potter, a book described by Blumenthal as “bound in Bengal tiger, with a white feline fang protruding from each corner” cannot help but invoke the image of the fanged and vicious Monster Book of Monsters," which must be securely shut with a leather strap. But the essay is not untouched by troubling ideas, with a passing reference to eugenics, its second paragraph comparing the appraisal of a book with the judgment of a human being based on “face, figure, bearing, gait, and other physical attributes. . .” And following a discussion of animal bindings, examples of books bound in human skin will raise for contemporary readers the specter of human desecration in a second World War that has not yet occurred for this essayist.